cinnamon buns and other candles. Order 100 candle making wicks for as little as 14.99. Order from the drop down menu above. 100 Small (44-24-18 Zinc) Burns 2 1/2 to 3 in. 100 Medium (51-32-18 Zinc) Burns 3 to 4 in. 100 Large (60-44-18 Zinc) Burns 4 to 5 in. 100 Big Bottom Votive Wick (44-24-18 Zinc) -32 mm tab, and 3 inches long. Fits the bottom of a metal votive cup. Order 10 wicks from the drop down menu. Small (44-24-18 Zinc) Burns 2 1/2 to 3 in. Medium (51-32-18 Zinc) Burns 3 to 4 in. Large (60-44-18 Zinc) Burns 4 to 5 in. kinds of wick. Lead wick, zinc core wick, an assortment of braided wick, speciality wicks for tea lights, and so on. 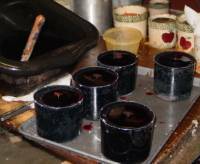 We sell the candle wick that we use in our candle making. We have used this wick for a number of years now. use. We never use lead core wicks, they burns to hot for our uses and you have the lead. referring to the diameter of the circle the wick will burn. candle burns smoothly, so be careful who you buy your candle wicks from. If they are poorly made they will burn poorly. Ever burn a candle and get that black mushroom glob on top of it! The wick is to large for the candle! And boy does it smoke! 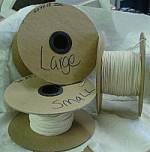 Adjust the size your wicking for the candle you are making. Your wax will have a lot to do with the burn of the candle too. If your wax is too hard, no wick will burn right. If the wax is to soft, the wicks won't burn right either. You just have to know your products. it. All I can give you is some guide lines to go by. When I started making candles, I would cut circles out of cardboard. I cut a few 2 and 1/2" circles, some 3 to 4" circles, and some 4 to 5"
Laid the.....O, lets say, three 2 and 1/2" circles in the bottom of a crock.... arranged like Mickey Mouse and his ears. three small wicks in that crock. For cake candles you don't want the sides to melt at all! This candle stands by itself and doesn't need a container, so the burning wick should leave over 1/4" to 1/2" of wax on the outer rim. Let me say it again...Test your candle while you are there and watching. be applied to other items purchased.